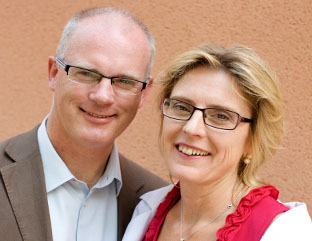 Alasdair and Olivia have been married for nearly 25 years. Having moved house twelve times in that time, they are now settled back in Cambridge learning to become city folk after living in the Fens for many years. After eight years of “subfertility”, they had just been approved for adoption when along came their very own free-range babies, now teenagers Alex (15) and Kana (13). Olivia’s main vocation is as extreme cappuccino drinker; on the side she is training for ministry. Alasdair, a doctor, bakes bread and builds fixies (bikes) and does research into the treatment of multiple sclerosis. You can meet other couples from our team HERE.